Ascend is a TK-8 public charter school in the Fruitvale neighborhood of Oakland. The student population reflects the demographics of the community, serving mostly Latinx families. There are 486 students: 10% are in special education, 70% are multilingual learners and 92% free and reduced lunch. 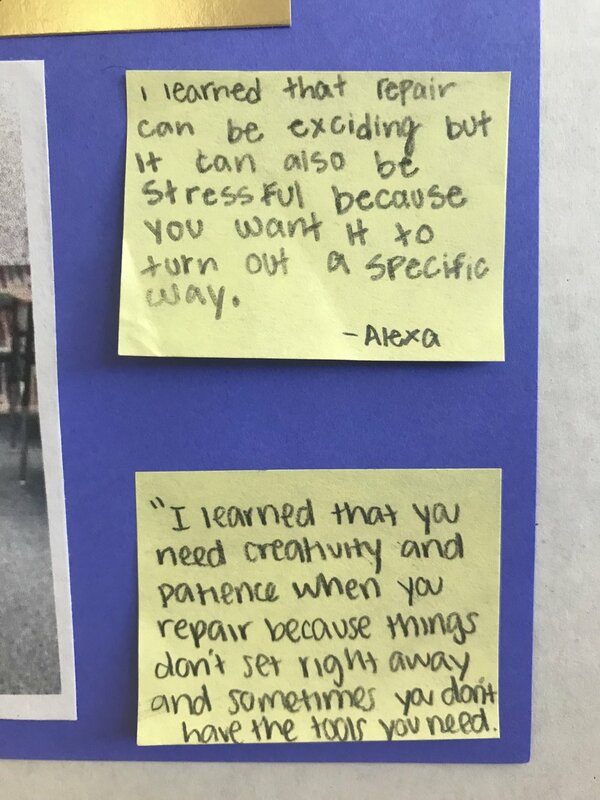 As I started my Agency by Design Oakland fellowship experience this school year I saw a clear line between what I was reading about in Maker-Centered Learning and in design thinking and repair work. I thought creating this elective would be a perfect place to explore the thinking routines and the repair grant provided the context. Therefore, supported by a Culture of Repair mini grant I started an “Art of Repair” elective class for students that meets once a week. What is repair? Who does repair? How do you repair? What do you need in order to repair? Who does repairing? How does it feel to repair something? We then discussed our ideas and one student documented them on the poster seen below. 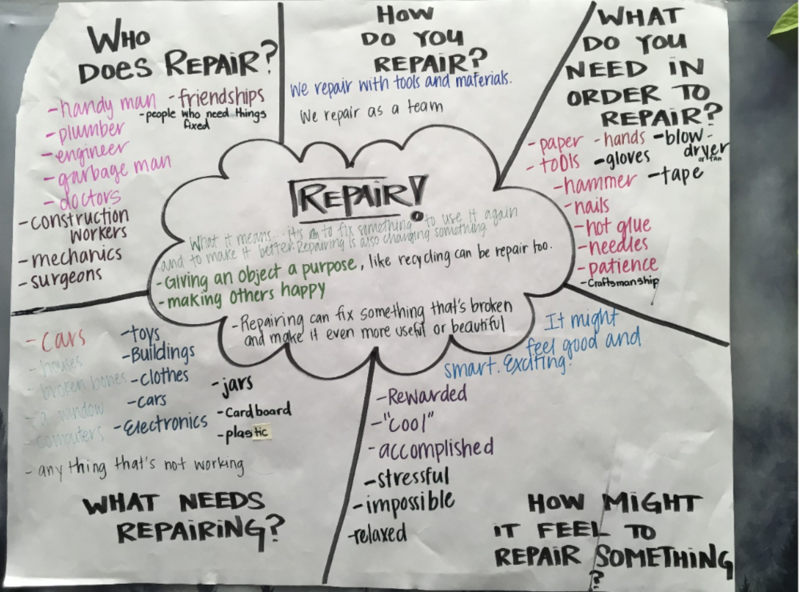 My goal for this conversation was to use this to frame all of our activities in this elective class, and to add our new ideas to this as our experience with repair grows. This first principal of repairing was connected to a Kintsugi project, the ancient practice of repairing broken pottery with gold, where they used epoxy and gold glitter to repair broken pottery. This second principal we applied to turning cardboard into a glider. 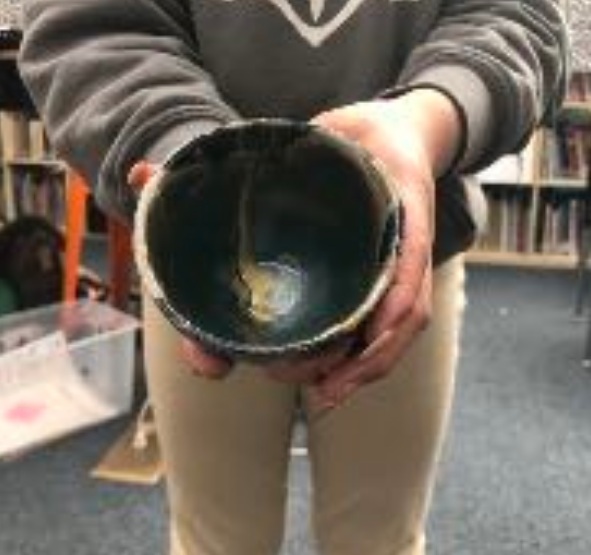 Students used the materials funded by the Culture of Repair mini grant (box cutters, rulers, epoxy glue, gloves, and more), and used Youtube videos to guide their repair work. We ended by reflecting on the questions from the beginning and added to the list in black ink. My intention in creating a repair related elective was to promote a problem-seeking and problem-solving sensitivity in my students. I want students to see something breaking or something not working as an opportunity. It could be an opportunity to take something apart and see how it works, it could be an opportunity to fix it so that it works again, or it could be an opportunity to turn it into art. I want the elective to be a space where they can develop the skills and confidence to repair what is broken and take pride in both the process and product. I called it “the art” of repair because our middle schoolers do not have an art class this year and I think it’s important for middle schoolers to have time to be creative and expressive. I also think by calling it “the art” of repair students will grow to see that repair doesn’t always mean returning something to its original state or even a functional state—sometimes the object can be transformed into art. My hope is that students are using skills of repair they learn in the elective to do repair work at home and around our school. I also hope that as we work and conflicts emerge that we can use our “Principals of Repair” to also mend relationships. My next step is to have students choose a skill to focus on developing. It is very easy for them to get discouraged and move on to a different project. I want to gear their experiences so that they are getting more “at bats.” This will build their expertise and their confidence as repairers. In my view, “failing forward” is a critical component of developing a repair mindset. I need build in pauses where we can reflect and monitor progress to see our growth over time. 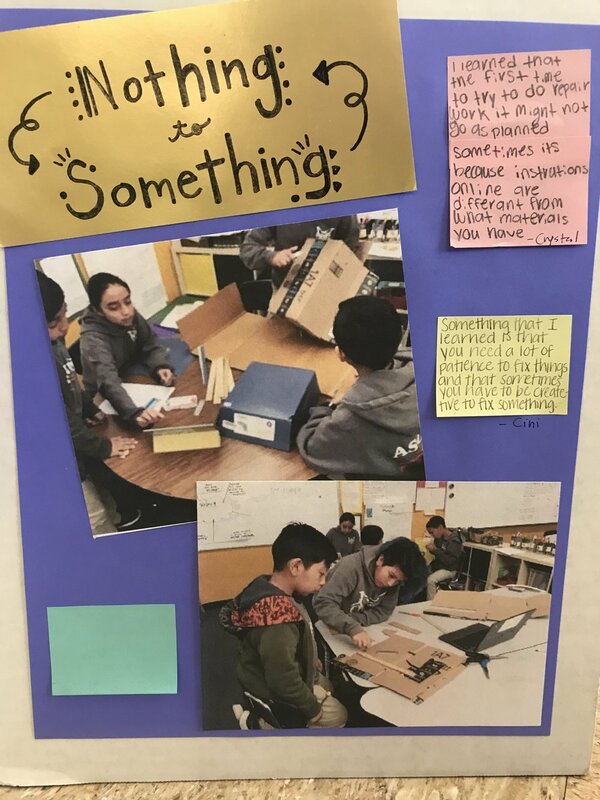 Sopar’s documentation board from the Agency by Design Oakland mini-culminating event in December, 2018. I am wondering how I can manage having students working on multiple projects or tasks at the same time. I am wondering what pitfalls there are that I should anticipate. I am wondering what types of questions I can ask to push students to deepen their exploration. As they begin to develop their identity as a repairer, I think their sensitivity to seeing opportunities for repair will grow as well. One way I can track that is by sending them home with a smaller version of the document we began the elective with. I want to see how their notions of “who does repair” “what needs repair” “ what is repair” evolve to include themselves, their family members, things within their home and daily life. A stretch goal would be to run a repair clinic at our school before the end of the year. I think it would be amazing to connect our school community with the larger repair community that exists in the Bay. 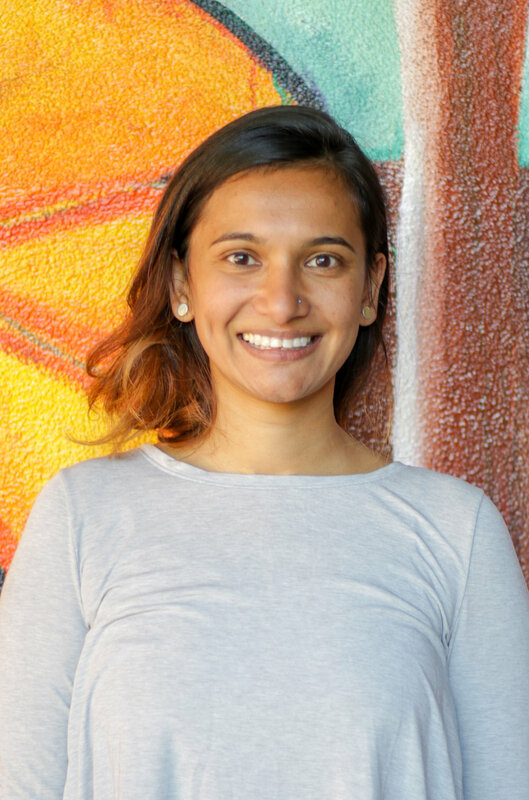 Shraddha is originally from Chicago where she began working with young folks nearly a decade ago. Since then she has taught middle schoolers in New York City, Mumbai, DC. She has been working at Ascend in the Fruitvale community for that last three years. She works to couple project based learning with accelerated academic achievement. She believes that students thrive academically and socially when they are learning in the context of caring relationships with adults who are willing to redistribute authority.